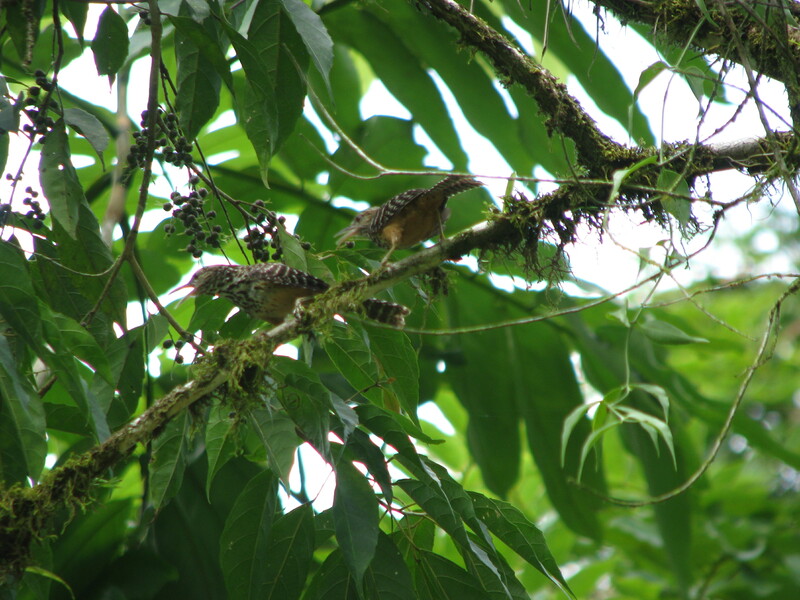 Two Central American Band Backed Wrens sing in duet. Photo courtesy Mike Wells. Copious diversity is defined in the all too precious rain forests of Costa Rica. A symphony of birdcalls and songs, a cacophony of insect buzzes and chirps and sweet floral aromas fill the sticky morning air. At 5 a.m. sharp, biologist Mike Wells is in position, armed with his binoculars and parabolic microphone, at the edge of the dense rain forest, observing 6-inch birds from a distance of up to 75 feet and recording their songs as they emerge from their nests. Wells, a biology student at the University of Minnesota in his second year of Ph.D. work, is studying the behavior of a petite songbird known as the Band Backed Wren (Campylorhynchus zonatus) at La Selva Biological Reserve in Sarapiquí, Costa Rica. 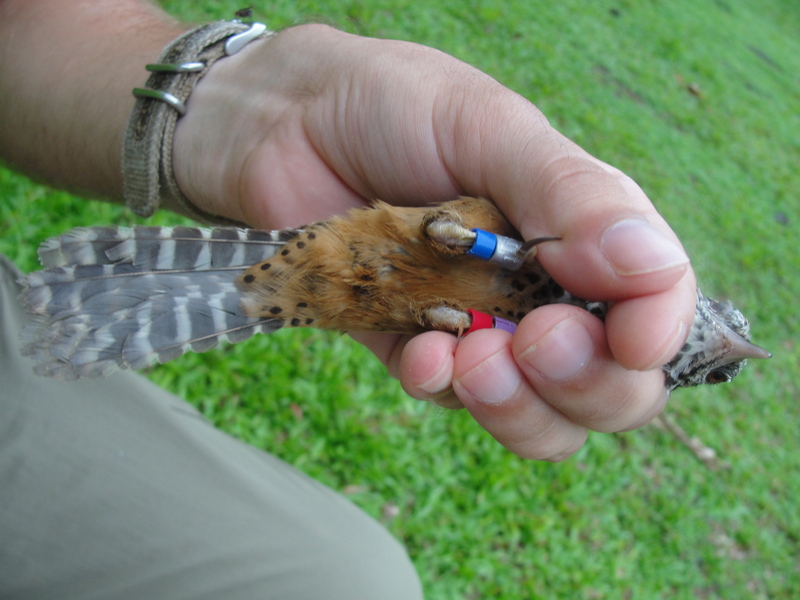 Harmless colored bands are used to identify wrens and track their activities. Photo courtesy Mike Wells. Residing in the abundant rain forests of Central America and northern parts of Ecuador and Colombia, the band backed wren engages in an exceptional form of social activity known as cooperative breeding. 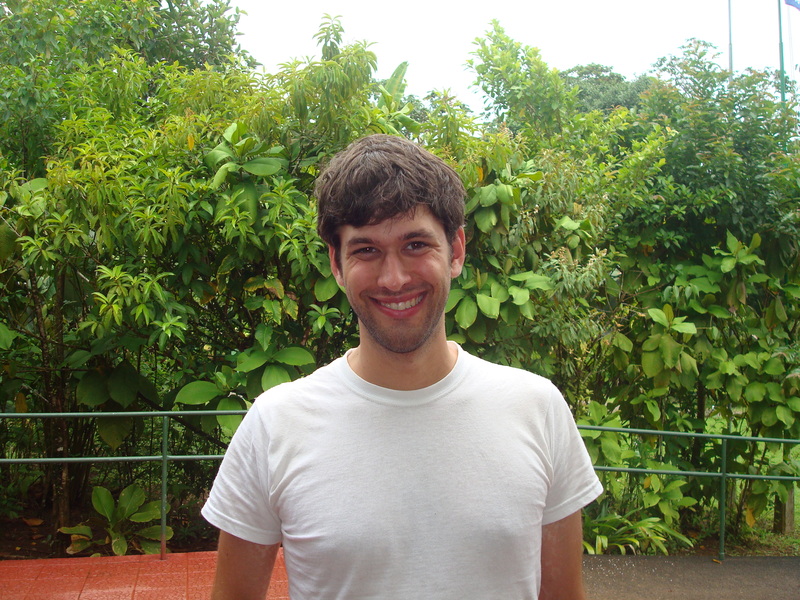 Mike Wells, graduate student in biology at University of Minnesota, is conducting research at La Selva Biological Institute in Sarapiquí, Costa Rica. Photo by Jeff Kessler. Cooperative breeding, a communal survival technique, bestows these tiny birds with a crucial advantage in the harsh competition for survival innate within any diverse ecosystem. The relationship manifests when animals live in groups usually comprising genetically-related individuals who raise the young collectively. Instead of sexually mature siblings leaving the family to breed on their own, they instead stay with their parents, the principal breeding couple, and help raise the next “clutch” or hatch of eggs. But the practice is rare. Experts estimate that “about 3% of the world’s birds are thought to breed cooperatively.” The study of the practice “remains one of the most tantalizing holy grails of behavioural ecology,” according to one academic article. Numerous direct and long-term benefits are generated from participation in this behavior. Because full-grown adult wrens only are, on average, 6.5 inches long and weigh just under 2 ounces, their small size makes them and their nestlings vulnerable to attacks from predators, such as toucans. To compensate for their size disadvantage, wrens procure their strength in numbers. “Toucans are known to feed on the young (of other birds),” said Wells, “so they (wrens) will attack toucans.” Though toucans are twice as big, the wrens can drive off these adversaries by cooperating and attacking together, all at once. According to Wells, the wrens´ habit of cooperation may also be to gain a larger territory. “If you stay and help defend the territory, you may be able to increase the size of the territory. This would increase the amount of food, the amount of shelter and opportunities you may have later on,” he said. Kin selection is another important factor in this natural phenomenon of social activity. “The idea basically is, if you’re related to an animal by descent…you share some proportion of their genes just by the assortment of chromosomes,” Well said. Kin selection, according to Wells, grants the younger wrens an improved likelihood of surviving to adulthood. Consequently the siblings increase the chance of passing on their own genes. Not all of the individual birds assisting in this communal parenting are necessarily related to the original family. Even some adult wrens that are not genetically related to a principal mating couple may come and assist them with raising their young. This is another area Wells intends to research further. “I’m really interested to see, especially in things like cooperative breeders which aren’t very far along yet, sort of what the dynamics are and what the pressures are, and what the payoffs are for the evolution of this,” Wells said. To test whether the wrens are “setting up for direct benefits, or they’re trying to get kin selected benefits from helping raise their siblings,” Wells will remove a breeding female from a community and a new female will come in to fill the breeding position. As a result, the original siblings will be related to the new offspring by one half. If these siblings are more interested in kin selection, rather than direct benefits, they may “change their investment,” meaning they may leave for another group that can offer them a chance to breed. Biologists are interested in whether this behavior is a learned adaptation or a natural instinct. The cause could possibly be a combination of nature and nurture. The natural instinct to survive may result in new adaptations and learned behaviors in this competitive and unforgiving environment. More conclusive research on this social behavior from Wells and other biologists will lead to a better understanding of animal cooperation and evolution.